Oil-Electric: CN's "Bent Paper Clip"
Canadian National 9124, and 4497. Prince Rupert, December 24, 1962. Although my family had moved back to Seattle in 1959, we had reason to visit in 1962. I was home in Seattle for Christmas from my studies at Washington State University, and Dad had been sent back to Prince Rupert as relief chief engineer on the ABC tug “Comet” over the Christmas slow down at Ketchikan Pulp. My Mom, Sister and I were talking over dinner, about us being in Seattle, while Dad was up in Prince Rupert. Within a few hours we packed up the family bus, and took off for the 1,000-mile trip to Prince Rupert. I was 19, my Sister was too young to drive, and my Mom could not drive. It wasn’t until we got up into the Cariboo Country, that it dawned on us what an adventure this was going to be! Tons of ice and snow, and a loooong way to go! But it was the disblieving look on my Dad’s face when I woke him up in his stateroom, the morning of our third day out! We had a wonderful Christmas with Dad and the skeleton crew on the “Comet,” with the cook being delighted at having us show up. I'd never seen such a big turkey, and we had all the trimmings! When folk ask, what is your most memorable Christmas, this is Number 1, with Christmas in Biloxi Number 2. The Bent Paper Clip. Naturally, I took the opportunity to wander across the road to the CN Engine Facility, where I spent so many hours as a young man, when we lived there from 1957 – 1959. A fellow by the name of Allan Fleming was barely 30 when he was recruited to come up with a fresh new logo for CN. He was Vice President and Director of Creative Services at the typographic firm Cooper and Beatty Ltd. when he designed the new CN logo in 1959. The new logo was introduced to the world, in January 1961. Sadly, Fleming died after a long illness in December 1977, at just 48 years of age. 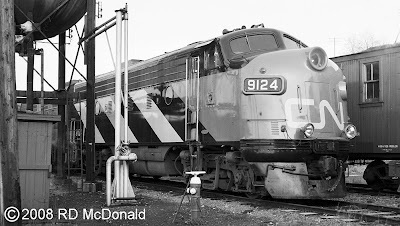 Railroad Stuff: CN 9124, built by GMD, London Ontario, as a F7A, 1,500 horsepower, November 1952, serial number A-398, GFA-15d. 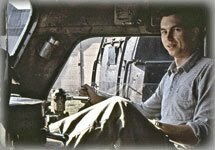 Tripped over rockslide at Mile Post 120.7, Ashcroft Subdivision, in March 1966 whilst in the company of CN 9066 (F7A) and Geep 9’s 4351 and 4284. Both cab units were declared constructive losses and retired. The Geep’s, running behind the lead cab units, were repairable and returned to service. 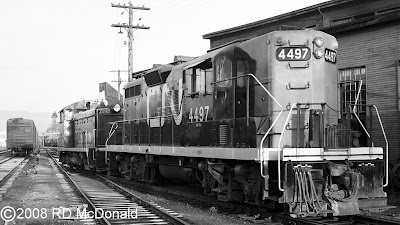 CN 4497, built by GMD, London Ontario, as a GP-9, 1,750 horsepower, November 1956, road class GR-17g. Re-numbered 4201 in 1957. Branch line Flexicoil trucks were switched out for Bloomberg’s in 1962, and returned to 4497. Rebuilt as road class GY-00f, slug number 243 in 1990.